Over the years, I’ve had the opportunity to cover a number of stories with scientists whose research takes place in the outer reaches of the Earth’s atmosphere and beyond. 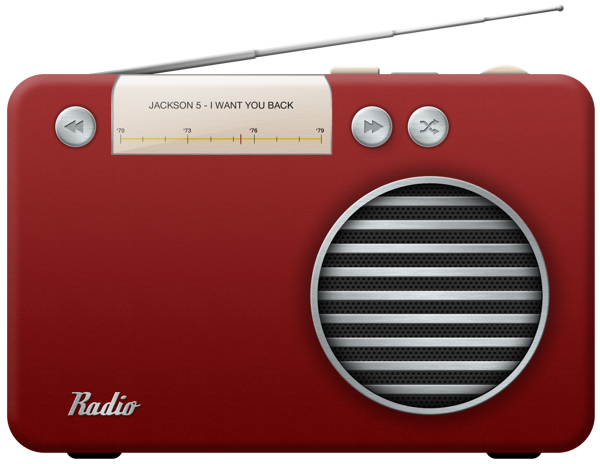 Here are a few links to some of those stories for your listening pleasure. A NASA spacecraft is headed for the outer reaches of the solar system. That’s the topic of a lecture hosted by the Geophysical Institute tonight (January 14, 2014). The spacecraft is slated to rendezvous with Pluto in the middle of next year. Fairbanks, AK – A graduate student from the University of Alaska, Fairbanks has garnered national media attention after he posted photos of a rare lightning-related phenomenon to his blog. Fairbanks, AK – People who frequent the trails on the campus of the University of Alaska, Fairbanks may have noticed lots of construction equipment all summer long. It’s part of a project at the Alaska Satellite Facility. The facility is getting a new antenna this year. In coming years, it will collect data from NASA’s polar orbiting satellites. Fairbanks, AK – Geophysical Institute is forecasting strong auroras at the end of the week. Some of that activity could be in response to changes in the suns magnetic field. Over the next few months, the sun will undergo a magnetic flip. Is an event that happens every eleven years, but scientists have only been able to monitor what happens at the solar poles since the 1970’s. Side-by-side comparisons of historic photos and those taken by Ken Tape show changes to Alaska’s Arctic over time. 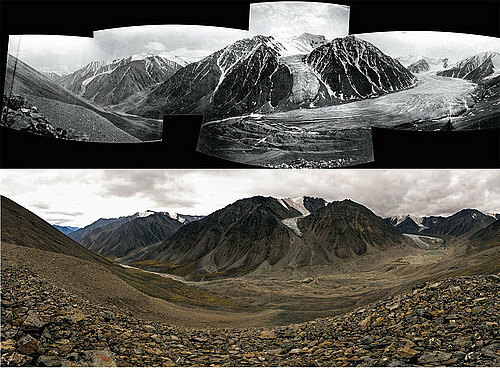 Ken Tape ’99 is amassing a collection of photographs that provide irrefutable evidence that climate change has affected the Alaskan Arctic. Bettles, AK – America’s National Parks serve as a back drop for some of the United States’ best known artwork. Much of that work was created long before the National Park Service established an ‘Artist in Residence’ program. One man has just completed his fourth residency in Alaska and his ninth in the United States. Emily Schwing caught up with Stephen Lias in Bettles to find out how he turns a backpacking trip on the arctic tundra into a classical music composition. 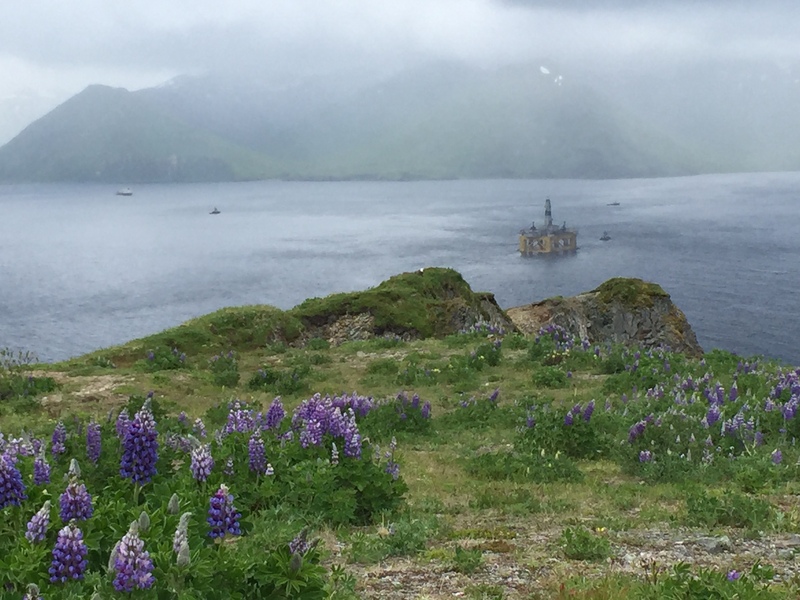 Dutch Harbor, AK – A massive oil rig, contracted by Royal Dutch Shell, has arrived in Dutch Harbor – in Alaska’s Aleutian Islands. The rig is scheduled to head north into the Arctic this summer as part of an exploratory offshore drilling operation. The rig and its operation had been the target of protests, at least in the lower 48. But the residents of Dutch Harbor have had a slightly different response, as Emily Schwing of KUCB reports. Fairbanks, AK – It will be a few months before butterflies flit through the air in Interior Alaska, but the Museum of the North at the University of Alaska Fairbanks was recently filled with them. 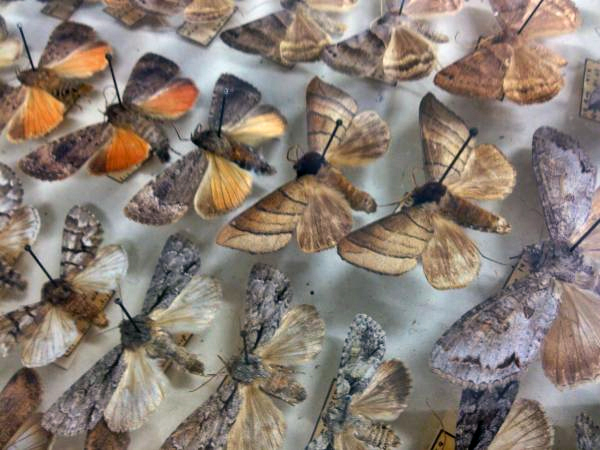 The museum is working to catalogue the second-largest collection of Arctic butterflies and moths in the world. It’s the largest private collection of its kind. Eventually most of the specimens will be passed on to the Smithsonian. 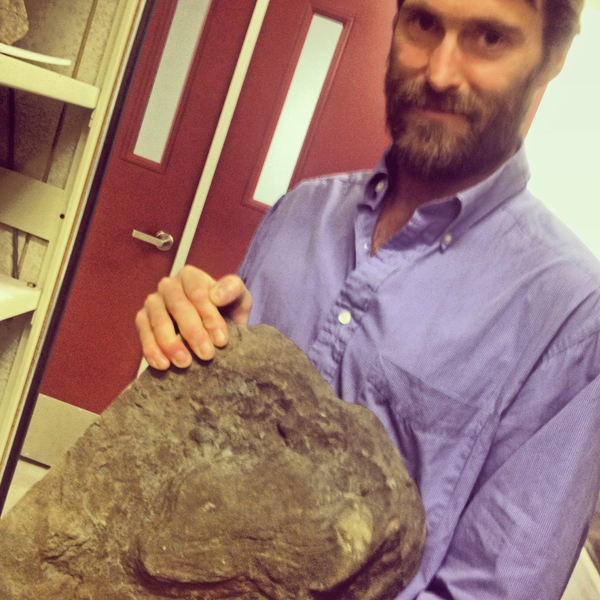 Fairbanks, AK – A trip down the Yukon River this summer yielded big results for one University of Alaska paleontologist. Fairbanks, AK – The University of Alaska, Fairbanks Museum of the North recently acquired as many as 150-thousand fish and marine invertebrate specimens from the National Marine Fisheries Service. 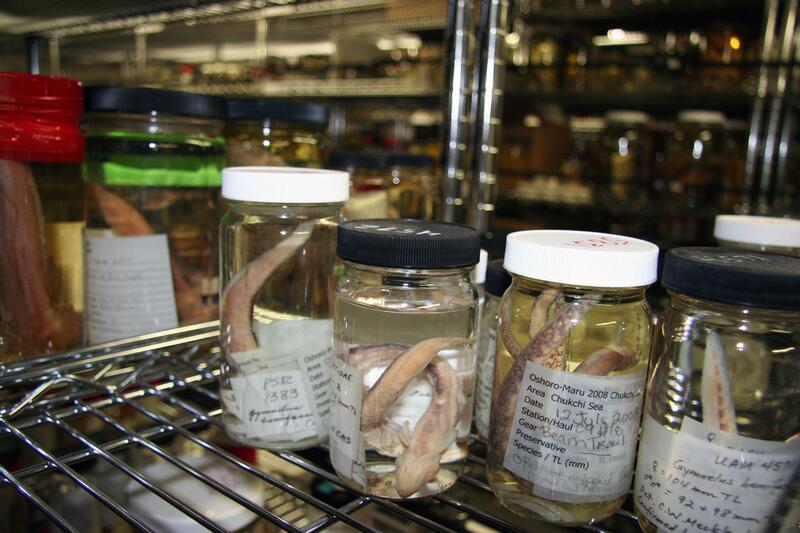 The acquisition means the museum’s fish collection has doubled in size. In a press release this week, Koahnic Broadcast Corporation (KBC) announced the four radio reporters they chose from across the country to spotlight tribes and key issues facing tribal and native communities during the through the 2014 election season. I am very excited to be one of those reporters. Some of the stories I’m working on have also aired on KUAC in Fairbanks, as well as stations within the Alaska Public Radio Network and on National Public Radio. Take a minute to check out some of the issues Alaska Native voters are facing by clinking the links below. Novoye Chaplino, Russia — Olga Letykai took the stage this summer in her usual performance attire, dressed from head to toe in seal skin, white fur at her cuffs, beaded headband on her forehead, traditional markings on her face. For those who had never heard Letykai before, what happened next was probably a surprise. While the frigid wind on the Bering Sea coast carried along an occasional call of a seagull, that was soon joined by the unearthly — and almost indescribable — sounds of Letykai’s throat singing: deep guttural noises mixed with heavy growling and panting, followed by sharp, bird-like trills. I’m probably out in the field wielding a shotgun microphone at something noisy right now, so It’s unlikely I’ve had a whole lot of time to update my blog/website/catch-all for my work. But feel free to browse. In the coming months, I’ll be posting old stories I’ve dug out of my personal archive. Together, we can relive a few years’ worth of long-distance sled dog racing, management decision regarding fish and game and endless discussions on affordable energy and climate change in Alaska.